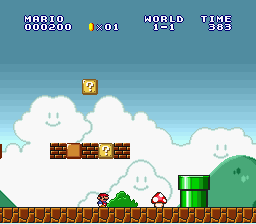 Since I was sick of seeing grass in world 1-1 where bricks should be I put together a hack to change several of the graphics of SMB1 in Super Mario All-Stars. 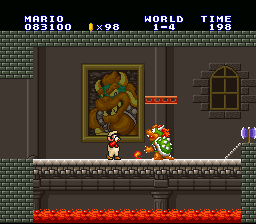 It changes them to graphics which are much closer to what they were in the 8-bit game. The backgrounds have not been touched. The ROM needs to be unheadered. Note that since Super Mario Bros. 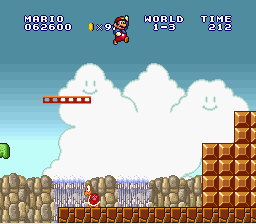 The Lost Levels shares graphics with SMB that game will be affected as well. This game has not been tested to see if the changes remain throughout that game. 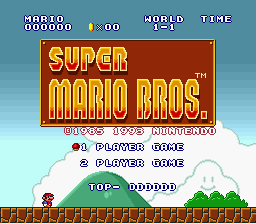 Note: The hack can be used with the SMAS SMB/Lost Levels Brick Fix hack if this patch is first applied to a non-headered SNES ROM. Then a header must be added to the ROM using a tool such as NSRT 3.4 Windows. 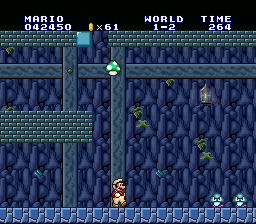 After that, the SMAS SMB/Lost Levels Brick Fix patch can be applied. From there, it is optional to remove the header once again.